Today was a typical snow day in the South. Lots of hype and most everything shut down ahead of time, only to wake up to find half an inch of snow and wet streets! Despite being disappointed that the sledding wasn’t going to be good, most kids were happy just to have a day off from school! Not Ryan! Snow has no meaning to him. We learned long ago that Ryan doesn’t find exciting what most kids do. Ryan would have been a lot more happy going to school this morning. Ryan loves school. I’m not sure why. He can give his teachers a hard time about doing his work. And yet, he wakes up in the early morning with a smile on his face. He’s dressed and ready for the bus in no time. I’m so thankful that school does not have to be added to his long list of battles. I have to give credit to his teachers and the school. I know we’re extremely lucky to have a public school and teachers who understand Ryan and what makes him tick. Ryan wasn’t convinced that it would be fun. But he got in the car. He gave me his little “pouty” face. He continued to pout all the way into the restaurant, while I ordered, and to his seat. But then something magical happened. When our food arrived, Ryan began to eat. And one more very important thing. Ryan did not have his hands on his ears. This was progress. 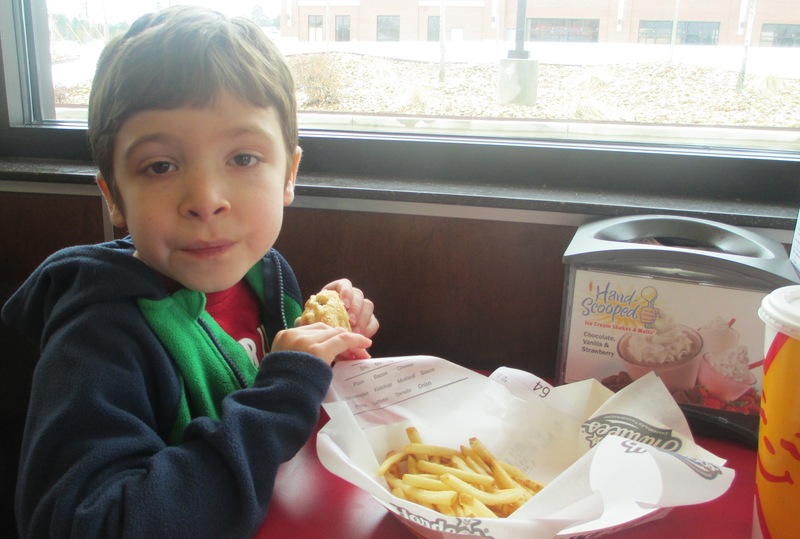 The last time we ate at Hardees, Ryan did not eat at all and sat with his hands on his ears, staring down at the table, his body stiff, the whole time. Kids like Ryan who are very sensitive to loud sounds and bright lights often keep their hands on their ears even if there is no loud noise. It’s a way of keeping themselves safe “just in case.” It’s interesting that Ryan can tolerate Chik-fil-a. It’s the only restaurant where he will eat and is somewhat comfortable. But there isn’t a Chik-fil-a in every city. Ryan will need to learn to tolerate many different types of restaurants. So, I considered today a success, even if he only ate his fries and not his hamburger. I made the experience short and positive. He got lots of high fives. He came home with a smile on his face. I wonder if Ryan will ever be excited about getting to eat out? That would be real progress. But for now, we’ll just focus on what gets him excited now, like getting to see a train go by at a crossing, or counting 25 security signs while traveling through the neighborhood, or seeing a car that looks just like “Mommy’s” car. Or even getting to work with his ABA (Applied Behavior Analysis) therapist on a snow day. She was able to make it after all. The streets were clear. “Do you want to play first or do work first?” his therapist asked when she first arrived.” Ryan said “Work first.” Go figure! Categories: In Need of Structure | Tags: ABA therapist, ADD, anxiety autism routines structure days off, anxiety sensory integration disorder school, autism, eating disorder, sound sensitive | Permalink. We wish we could rid the school calendar of all the holidays, breaks, and teacher work days. Ryan and I do not enjoy days off from school. While all the stay at home moms are listing their teacher work day and holiday plans on Facebook (sleeping in, roller skating, play dates, movies, pizza lunches) Ryan and I are lamenting that our daily routine will be changing for 2 1/2 days. Today is a half day of school. Ryan will be home at noon and trying to adjust to the fact that he won’t be eating lunch at school. “What’s next? What’s now?” will be the questions he’ll be asking over and over this afternoon. Children on the spectrum love routines. They need to know what’s happening each minute. We won’t be going to the movies or out to lunch (too much over stimulation). 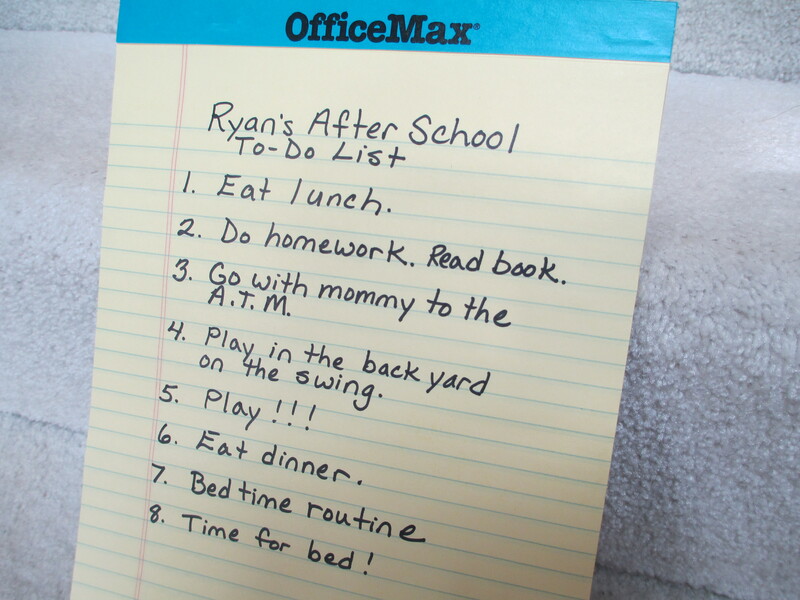 But we will be checking off the items on our after school “to do” list. The structure will be calming and hopefully will help Ryan get through the rest of the day without too much anxiety, change in appetite, or the ability to sleep tonight. Something as simple as a “to do” list can save the day. Categories: In Need of Structure | Tags: anxiety autism routines structure days off, structure | Permalink.